Sega put the lid on the rumors from the Nuremburg Toy Fair about a new Sonic the Hedgehog title for Wii U, PS4, and Xbox One. Information from the Nuremburg Toy Fair in Germany indicated a new Sonic the Hedgehog title was in the works for Wii U, PS4, and Xbox One and would launch in 2015. Sega issued a statement refuting this information, calling it incorrect. "Sega is yet to announce details of upcoming console video games for Sonic the Hedgehog or further details regarding the new Sonic CG TV series," Sega stated. "The recent information coming out of Nuremburg Toy Fair was incorrect." The Nuremburg Toy Fair had a display about Sonic the Hedgehog news for the year, including new games were Sonic Lost World for Wii U and 3DS, Mario & Sonic at the Olympic Winter Games: Sochi 2014 for Wii U, and a "New 2015 title TBA" for Wii U, PS4, and Xbox One. 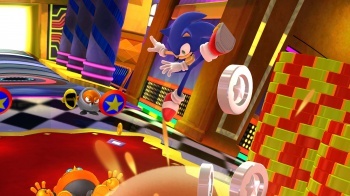 Sonic Lost World launched in October 2013. Mario & Sonic at the Olympic Winter Games: Sochi 2014 launched in December 2013. The display also stated there would be a new show. The cartoon has a working title of Sonic Boom and will be the series' first CG animated show, set to begin this fall on Cartoon Network. The Escapist has contacted Sega for confirmation and any additional news concerning Sonic the Hedgehog future titles. We'll have more details as they become available.